David is an aspiring Bravado chef. In a reflective moment over cocktails (I think vodka was involved), he said he dreamed of making Veal Piccata, one of his favorite dishes, but knew he would screw it up. It reminded me of Charlie Brown waiting for the famous fly ball that he knew he would drop. After the usual chiding and berating – something fellow Bravados do – he agreed to try making it the following day. He produced an incredible dish on the first try. David has since gained an almost sickening sense of self-confidence and now thinks he can do anything. This sounds like a complicated recipe (which you can use to your advantage as you describe it to guests), but it is really quite simple – even David could do it. It will probably take you longer to read the recipe than it will to prepare it. However, even though this is an easy recipe, one practice round before game time is not a bad idea. 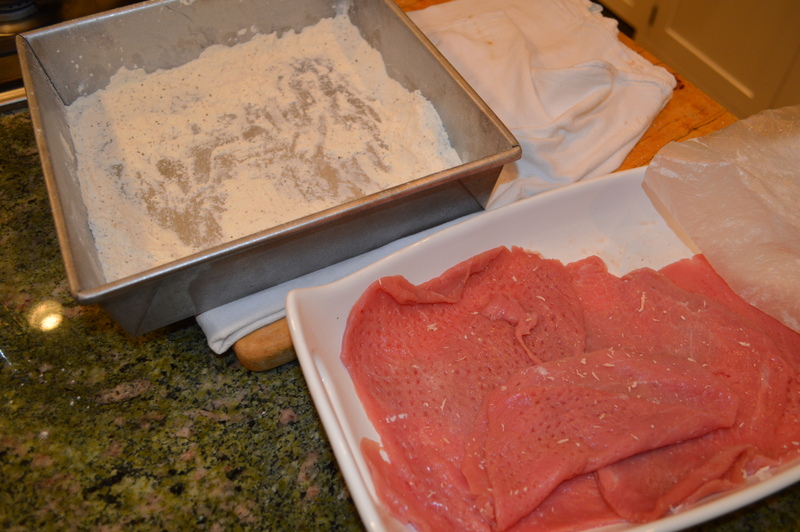 The key task is to find a good source of veal and a butcher that knows how to cut “scaloppini” style. Many larger supermarkets have or can order packages of pre-cut veal scallops or cutlets. This is usually the best bet. If there is concern about using veal, you can substitute chicken breast, which we discuss below. This is a great Bravado recipe since the actual cooking time is relatively short and can easily be done in front of your guests. You will have the opportunity to pound the veal, dredge in seasoned flour, sauté the scallops and finally “deglaze” the pan to make a great sauce while everyone looks on. You will be an instant hero – viewed with awe and adoration since few of your guests will have ever seen this done before. All the while, you and the guests will be sipping a lovely Pinot Noir, a great wine pairing for this dish. Pinot is the French word for ‘pine’, referring to the pinecone shape of the bunches. Noir means ‘black’ and refers to the dark colored grape. The most famous pinot noirs are the Burgundy wines are from the Cote d’Or region of France, southeast of Paris. Beaune is the main city of the region. The French name all wines by geography (village or region) rather than grape variety (cabernet sauvignon, merlot or pinot noir). However, all red wines from the Burgundy region are pinot noirs. This grape is extremely difficult to grow and there can be wide swings in quality year to year. Other varieties like cabernet sauvignon are much more resilient. If budget permits, try to find a quality Givrey-Chambertin from France. Washington and Oregon produce excellent pinot noirs in the U.S. This is also a great recipe because there are so many things the guests can do to help. They can pound, dredge or chop – all under your expert tutelage. As they participate, they will become excited to try the final product and, almost like the placebo effect, they will think it is the best thing they have ever had. Showtime Stats: Capers are actually buds from a rose-like bush grown throughout the Mediterranean and are the key to this dish. This is one of the oldest known food ingredients, appearing in the Epic of Gilgamesh on Sumerian clay tablets (one of the earliest known writings) about 2700 BC. When pickled in vinegar, they release a mustard oil in the bud that has a tangy or tart taste. Smaller capers – under 10mm in diameter – are generally considered better. The French call these small capers “nonpareilles”, which means unequaled. Sometimes they are preserved in salt in addition to vinegar. Rinse off the vinegar and salt before using. Tech Tip: Have all of your ingredients ready and the prep work completed before you start to cook. Make this a standard practice like putting on your golf glove before you tee off. If everything is at hand, you will avoid the frantic, last minute search for something. In this recipe, make sure you chop the parsley and the garlic before you begin, unless you want the guests to do this. Use your small ingredient bowls for these and the capers. Note that two cups of white wine is over one-half of a bottle, so make sure you have enough. When finished, this dish should be served immediately. Therefore, if you are planning to accompany this dish with something like oven roasted rosemary potatoes, we need to think about schedule. Make sure you get the potatoes in the oven before the guests arrive, since they take over an hour. They will smell the rosemary when they arrive. 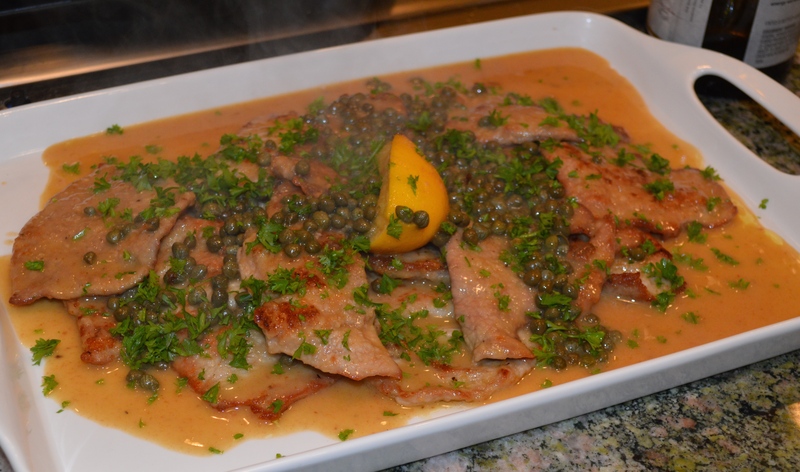 Then offer them a drink, serve an appetizer and start the veal piccata about 30 minutes later. The veal piccata takes about 30 minutes from start of pounding to finished product, so you have plenty of time for a drink and appetizer before showtime. You can serve sliced tomatoes with olive oil and a dash of balsamic vinegar as a second vegetable, which can be prepared ahead of time. You will basically sauté the scallops in two batches. The recipe is designed for eight people – the perfect dinner party. Using the rough side of your meat pounder and a cutting board, pound the scallops to a thickness of about 1/8-1/4” – the thinner the better without tearing the meat. Put the pounded scallops on a plate and separate them with wax paper. Cut the larger pieces in half. Veal can be quite tough and pounding is necessary to break down the fibers in the meat. You can be fairly rough with veal, so pound to your heart’s delight. Mix the flour, salt and pepper in a mixing bowl and transfer half to a shallow plate – the “dredging” plate. In a large sauté pan or skillet, heat 1-1/2 tbsp. each of olive oil and butter over medium heat. With your hands, take a scallop and drag both sides through the flour mixture and shake to remove any excess flour. Put the “dredged” scallops into the pan or skillet but do not overlap. You should be doing this in front of your guests. Let one of them help do the dredging. Cook about 1-1/2 minutes per side, remove and put into a glass baking dish. Put the dish into the oven to keep warm. After you have done one-half of the scallops, put another 1-1/2 tbsp. of olive oil and butter in the pan, add the remaining flour to the “dredge plate” and prepare the rest of the veal as above. Now you have a pan with oil, butter, flour, drippings from the meat and you may wonder what is next. This is where the fun comes in on many wonderful dishes. We will use all of these remains as the basis for the sauce for the scallops. Add the wine to the pan and scrape the bottom with a spatula to mix all of the remains with the wine. (NOTE: You should use the same wine you are drinking – the Bravado chef does not throw in some cheap “cooking wine”.) Turn the heat up a little bit until about one-half of wine boils off – about 5-7 minutes. You have now completed a process called “deglazing”. Lower the heat to medium and add the chicken stock, the capers, lemon juice and garlic, and allow to cook for another 5-7 minutes. The sauce should thicken as the volume of liquid reduces and the flour reacts with the liquid to form a more gravy-like consistency. Let your guests stir until the thickening occurs. When thickened, add the remaining butter (5 tbs.) and the parsley. Check to see if you need more salt. Add the cooked scallops back to the pan; stir well and heat for another 2 minutes. Take to the table and serve immediately. The lemons and capers give this dish its unique taste (the butter also helps!). There are a number of variations of this dish, one of the most famous being Veal Marsala. In that recipe, the lemon, capers and white wine are replaced by shallots, mushrooms and Marsala wine. Have some fun and create your own special “picatta”. For those who don’t like veal, try the following variation on the theme. Fine, you can easily substitute chicken breast. Everything is the same except the preparation of the chicken scallops. Chicken is very difficult to pound since it is generally too tender and tears. Therefore, you should filet it. If you explore the breast with a filleting knife, you will see that each half divides easily into two parts – a smaller filet that looks like a chicken tender and the larger breast muscle. Usually, the filet can be left as is. Put the breast muscle on a cutting surface and place your non-dominant hand on top. Carefully slice the filet under your hand so that you end up with two flat pieces. If you are intent upon pounding, put the breast filet pieces between two layers of wax paper and pound gently with the flat side our your pounder. Don’t get carried away. You are now ready to proceed with step 2 above.